While the end of one’s life can come at any time, most people have some forewarning of this event, and can prepare for it. One integral aspect of transitioning a family through the death process is the creation of an estate plan that will direct them how to handle a loved one’s affairs after death. An estate plan is an important feature of planning for death, but there are additional measures a person can take to make the loss easier for the survivors to navigate legally and logistically, particularly when it comes to finances. However, the process is also applicable to tangible property, such as the contents of a home, vehicles and collectibles. When someone dies, there are a number of decisions that must be made immediately, including legal mechanisms that regulate access to information and finances, as well as the ability to transfer ownership of property to an heir. A discussion of the steps a person can take in early days of retirement, as well as options to simplify personal and financial affairs as one nears the end to streamline estate planning issues, will follow below. reducing the number of open and active credit cards. In addition to the precautions mentioned above, a person can delegate authority over his/her financial affairs to another through a power of attorney, though this document must be executed while a person is still fully competent, another motivation to plan ahead for these issues. Considerable thought should be devoted to picking the person to take over this responsibility, and consulting with an experienced estate planning attorney to ensure the documents are properly executed is a key component of this process. Another part of delegating this authority is at least telling the trusted person where to find the information he/she needs to access accounts, if not giving the person the information directly in advance. Online access to account information, with carefully chosen usernames and passwords, can also be extremely helpful. copies of one’s driver’s license, passport and credit cards. Having multiple copies of these documents (both paper and digital), as well as keeping trusts, wills, advance directives and powers of attorney with one’s estate planning attorney, will guard against loss or destruction and better ensure their proper implementation. 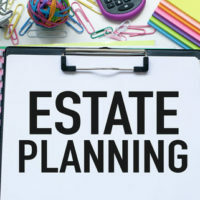 Estate planning should not be a one-time process, and requires reassessment at regular intervals to account for changing circumstances and goals. Attorney William Rambaum has decades of experience helping Florida seniors with their estate planning needs, and knows how to arrange an estate plan that will keep you financially healthy during life and provide security to your family after you are gone. Contact the Oldsmar law firm to schedule an appointment.